The United Nations Secretary-General, Antonio Guterres says prosperity, dignity and a healthy planet can best be achieved through implementation of the 17 Sustainable Development Goals (SDGs) as World’s blueprint. 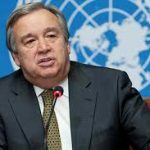 Guterres made this known in a statement on Tuesday issued by Mr Oluseyi Soremekun, National Information Officer, UN Information Centre (UNIC), Lagos. According to the statement, made available to the newsmen. Guterres spoke through Mr Ronald Kayanja, UNIC in Nigeria, in his message to the first Covenant International Model United Nations (CIMUN) Conference. 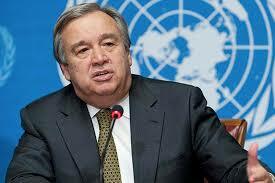 He quoted Guterres as saying : “our world today enjoys remarkable opportunities to advance common progress. “The 17 Sustainable Development Goals are our blueprint for dignity, prosperity and a healthy planet,” Guterres said. “These problems and challenges are increasingly global and increasingly grave. “We need less hatred, more dialogue and deeper international cooperation, multilateralism is more important than ever, empowering the world’s young people is also an imperative”.